Over the last few years, there have been innumerable changes in the SEO world. As a result, it can be confusing and challenging for you to keep a strict check on every on-page SEO element. But the reality is that these factors are relevant and significant for you as well as the search engines. To make sure you are not penalized or you get removed from Google, the finest way is to optimize your website for all on-page SEO factors. If you are still practicing conventional SEO techniques and are finding it difficult to improve the overall visibility of your website, then no need to worry. 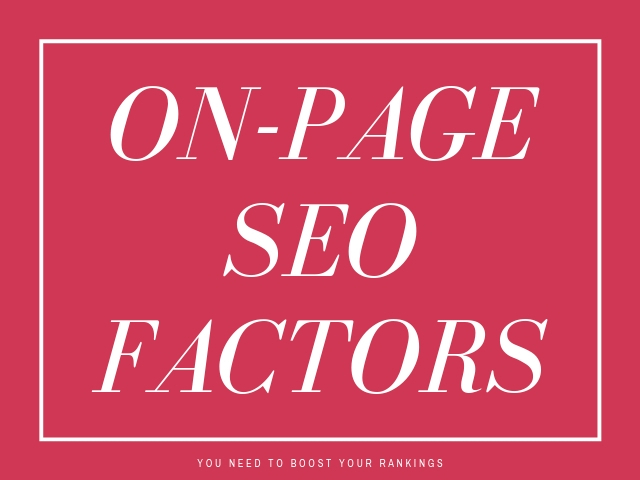 Here we are going to share with you a detailed guide for on-page SEO factors. Having knowledge of all the on-page SEO factors, you will be able to boost the Google rankings, boost sales conversions, increase click-through rate, generate better leads, and drive more traffic to your website. On-Page SEO – What is it? It is the process of optimizing single pages of a website to rank high in the Google SERPS upon the query of the user. It is not similar to on-site SEO, which is the procedure to optimize the complete website. However, these two kinds of optimization are not exclusive. For instance, an action of on-site optimization such as installing an SSL certificate is similar to a good on-page optimization technique. How On-Page SEO is Different from Off-Page SEO? Off-page SEO is nothing but the process to build links. It is related to acquiring backlinks to your site. As compared to this, on-page SEO is the foundation for any website to rank. You will require a substantial plan for off-site to obtain backlinks to your webpages and website as a whole. Though you can rank without numerous backlinks, in most situations, you will require them. A large number of SEO users consider on-page SEO simply as the technique to place keywords on a page. It’s true that keywords are important for on-page optimization, but the process involves other things as well. It is essential that you have complete understanding and execution of these on-page SEO factors so that you can determine how well your webpage will rank in Google. So, now let’s glance at the important On-Page SEO factors that you must know about. The first easy and efficient way to measure the SEO performance of your webpage is Google Analytics. This tool is quite hard to beat. If you don’t want to use it then you can check other decent alternatives. The only thing to ensure is to track organic search conversions and traffic. In addition to this, you must closely monitor your primary keyword phrase. This is not a straightforward process because of personalization, localization, and other factors involved. However, still, you must track your primary keywords to make sure you are moving on the right path. The next on-page SEO factor to consider is to find out whether your page is crawlable or not. It is not possible for your website to rank if Google spiders are unable to access it. The two prominent culprits to look for in this context are ‘noindex’ tags and ‘robots.txt’ file. There are numerous tools that you can use in order to make your website index and crawlable. You just have to enter your website’s URL and this tool will show everything that is blocking the search engine crawlers. Along with crawling, it is essential for your website to be indexed by Google. The finest way to check whether Google is able to index your website or not, you must copy and paste the site’s URL into Google. Also, check for pages that you want to be indexed. If they are not indexed then you have to practice some additional steps. Another way to get your page indexed is to obtain backlinks. As far as keywords are concerned, the first thing to consider is to target the appropriate keywords. You have to perform a competitor analysis process and extensive keyword qualification to make sure you target the right keyword. You must eliminate keywords with high Keyword Difficulty. If a keyword passes a keyword difficulty test, then you must compare the website for it against your competitors. It is a condition when numerous pages target one same primary keyword phrase. This is something that you have to keep a check on. It is best to avoid this tissue at the onset. If you don’t do this, then you will end up having a long list of keyword cannibalization issues. A solution to this problem is targeting one keyword at a time and checks your website’s response for the same. Understanding the intent behind the target keyword must dictate the structure of your webpage. Most of the search engines would want your primary keyword to be in the page title. But along with appropriate placement, you must improve the clickability of your title. There are various words used by Google in the title tag to understand what exactly your page is about. But there is another aspect to understand. You must check your website for CTR performance in the Google Search Console. If you are able to successfully create an eye-catching title then it can bring you an immense volume of organic search traffic even when your site does not have new content. Adding modifiers such as ‘top’, ‘best’, ‘year 2019’ and more are great to capture long-tail organic traffic. Your page title can be as long as 65 characters. In order to bring maximum advantage to it, place your keyword in front of the title. Along with it, you must use copywriting techniques to encourage searchers to click on your result. Every single page of your site must be wrapped in an H1 tag. There are online tools available like Screaming Frog SEO Spider, which you can use to find out pages that don’t have H1 tags. The good thing is that you can have multiple H1s on one page, but make sure that it is only a rare thing and you don’t practice it for every webpage. Often times, Google rewrite Meta descriptions. However, still, it is an excellent idea to create descriptive Meta descriptions with a primary keyword. Just like your webpage title, even the Meta description must be click-worthy and offer users at least some idea about the page. Webpages incorporating primary keyword in the URL tend to perform better than those who do not have it. Also, this is a small ranking factor. Some evidence proof that a shorter URL structure will perform better. It is mainly because a shorter URL is good for UX as long URLs are difficult to remember as well as share. Even, there are no advantages to having a long URL. Hence, it is best to create a short URL that searchers can conveniently remember. This is something you must do beforehand. Including a primary keyword in the first sentence help Google’s algorithms to understand your page and make things absolutely clear to you. Just make sure that you place the keyword naturally in the sentence. While some may suggest you to not focus too much on keyword density, I personally suggest that it is an important on-page SEO factor to consider. Write your content in a natural way as possible, while considering the density of your keyword at the same time. One way to achieve optimal keyword density is to first create the content and then adjust the keyword into it. A smart move is to structure one webpage around one primary keyword. But additionally, you must use variations of keyword in the web-page copy. As per the Hummingbird algorithm from Google, you can rank pages based on themes and simply not on the basis of keywords. It is essential to format your page structure around the primary keyword, but you must also incorporate other relevant LSI keywords that revolve around the topic. It is better to create unique content than drafting long pieces of content for every page of your website. Aim at bringing something fresh and new to the searchers. This can be case studies, testimonials, feedbacks, reviews, and results. Including such elements will make your piece unique and will persuade searchers to be a leader. This will also increase trust among the searchers and build your brand’s reputation. A large number of local businesses are not interested to invest in design. Even they do not focus on their website’s UX. However, these aspects must be primary factors of concern. One must invest enough money and time into aspects like quality photography, graphic design, video production, and more. Investing in quality videos and images can actually boost your rankings. Your content must be free of grammatical and spelling errors. Try creating content copies that are longer than your competitors. In addition to writing a copy well, it must be scannable, engaging, and easy to understand. Use short-paragraphs and structured headings. Incorporate keyword variations and LSI and descriptive headings where necessary. Make sure your webpage has unique and more images than your competitors. The images must be of high quality and must be placed in the correct image format. Furthermore, the size of your images must be appropriate and they must possess a descriptive file name. Video content is one of the finest ways of content consumption over the internet. Your videos must include your primary keyword and must be relevant to the webpage. These videos must be unique to the brand and they must be valuable and of high-quality. The video content must be responsive. Most importantly, you must host it on the correct platform. These videos must be optimized for SEO. Internal links are a robust way to build your website’s authority. They are even helpful to improve the crawlability and indexability of your website. The best thing is that it can help rank better the vital pages of your website. Additionally, the internal links must incorporate descriptive anchor text. These internal links must be optimized on the basis of first link priority. It is better if your webpage incorporates breadcrumbs. Make sure you incorporate internal links in order to please the users. These links must serve a purpose and help the user in one way or the other. Additionally, the internal links must use preferred URLs. Also, it is a great idea to include external links to your site as they can help build trust. Make sure your pages have fast loading speed, which is less than 3 seconds. They must be mobile-friendly and responsive. Your website must have an SSL certificate. Even, the font type must be legible and easy to read on all the devices. The font size must be big enough and must use aggressive interstitials. These are the prominent on-page SEO factors that you must consider. Just follow them to offer the power of On-page to your website and witness immense gains.